We would like to introduce the lastest addition to the Yellow Fence Family… Baby Cole arrived August 17th, 2 weeks ahead of schedule. 8 pounds, 2 ounces, 21.5 inches long & sporting a full head of blonde hair! Awww! Congratulations! Look at all the blond hair! Congratualtions! What a blessing to have a new member of your family. His hair is gorgeous! Congratulations! He is just beautiful! I can’t believe all the hair he has. That is the cutest baby that I have seen in a long time. 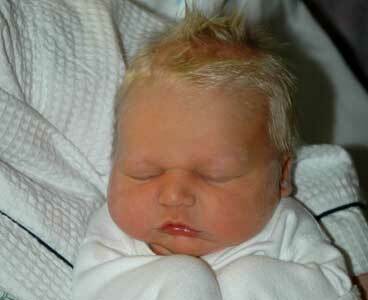 I don’t think I have ever seen a baby with that blonde of hair and that much! Congratulations!